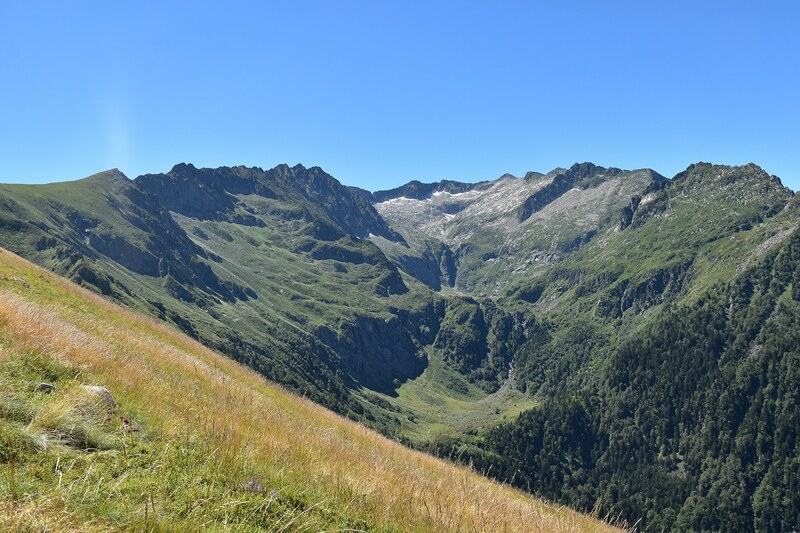 Hiking to the Pique Rouge de Bassies is a wonderful, challenging hike. 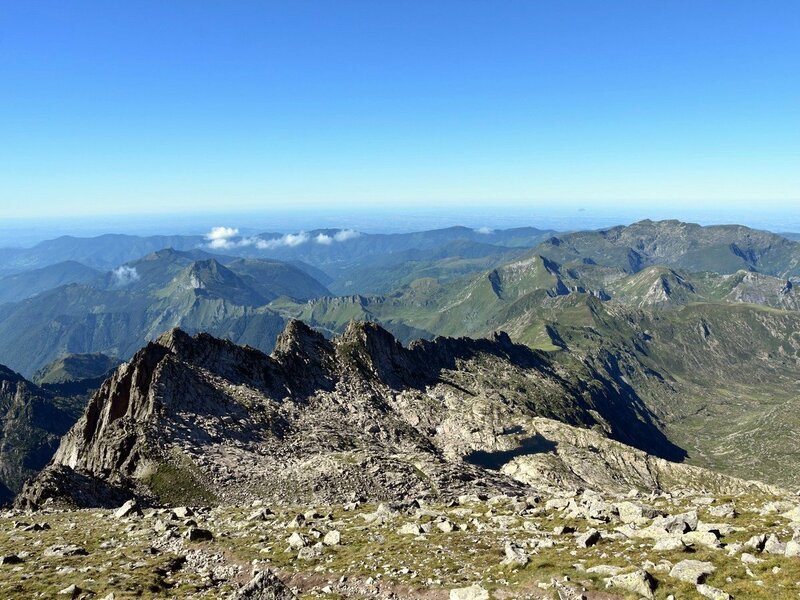 The main peaks in Ariège are some of the most remote and less accessible peaks of the French Pyrenees, and this is one of the few that can be done in a single day. 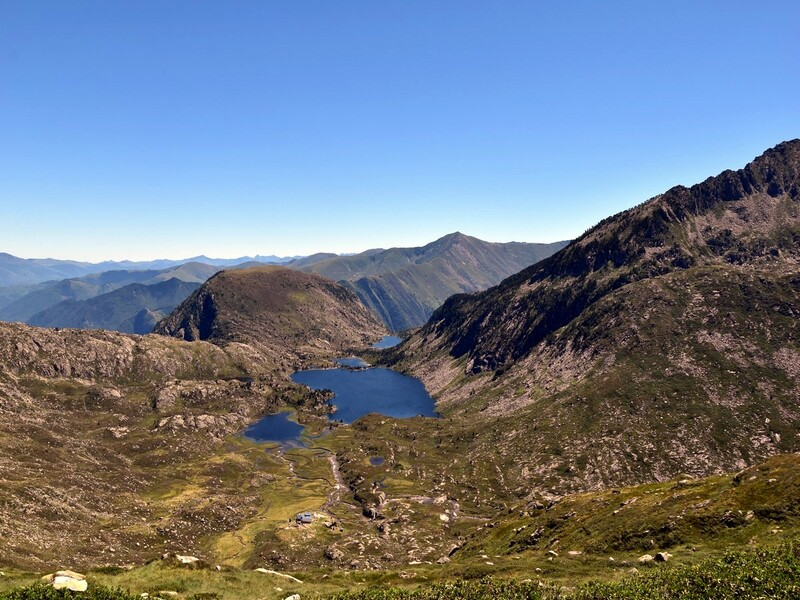 Stunning views can be enjoyed almost all along this fantastic ridge walk. A must-do hike in the Pyrenees. From the village of Aulus-les-Bains, take the road which leads to the Col d'Agnès. Park at La Coumebière, about 2.0km before the col, where the road meets the GR10. There is a substantial car park at la Coumebière (1399m) which is often full in high season, so you may have to park alongside the road (plenty of space available as well). Do not worry too much about the crowds though, as most of the walkers do not venture further than a few kilometres away. Pick up the GR10, heading SE for about 300m and leave it as it veers east (left). Follow the yellow-marked trail which continues south, soon rising through the forest. It takes a sharp turn left (E) at ca. 1550m, passing by some ancient silver mines, and then it levels as it veers south just before reaching the small Étang de Labant (1597m). Pass the Étang (it’s on your left) and you have a short steep climb through forest that soon emerges on a shoulder. Here the path makes a sharp turn to the left, heading south-east. The views suddenly open to the right, over a deep valley surrounded by two steep ridges, with the main ridge of the Pique Rouge de Bassiès visible to the left (the peak itself is not yet visible at this stage). 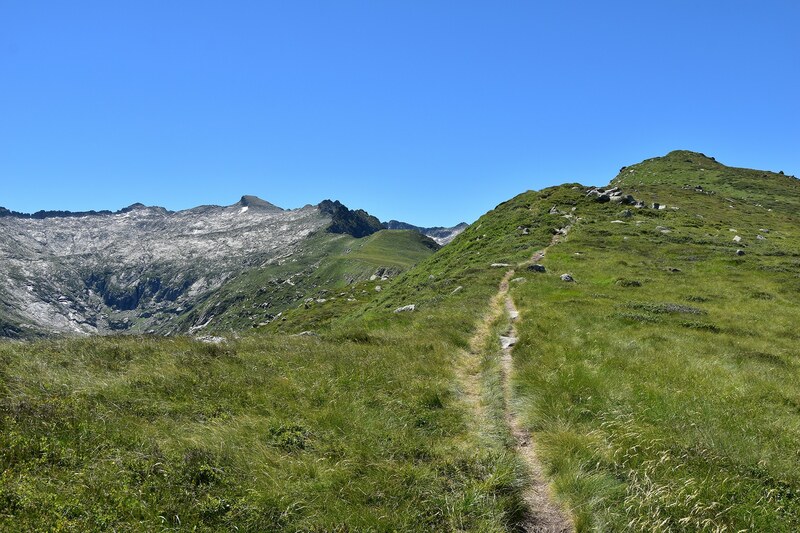 The trail narrows as it gently makes its way along the steep, grassy slopes of the Pic des Fouzes (2001m, actually the W shoulder of the Pic de Cabanatous (2053m)). Around 1800m, the trail starts rising up steeply to reach the Col de las Fouzès at 1944m. Spot the “orri” (local name for an ancient stone hut) to your left, before enjoying the stupendous views to the east over the beautiful Lacs de Bassiès below. The size of the Refuge de Bassiès, which stands just below you, gives a hint of the grandeur of the scenery. From the col, go right, heading south up the ridge. 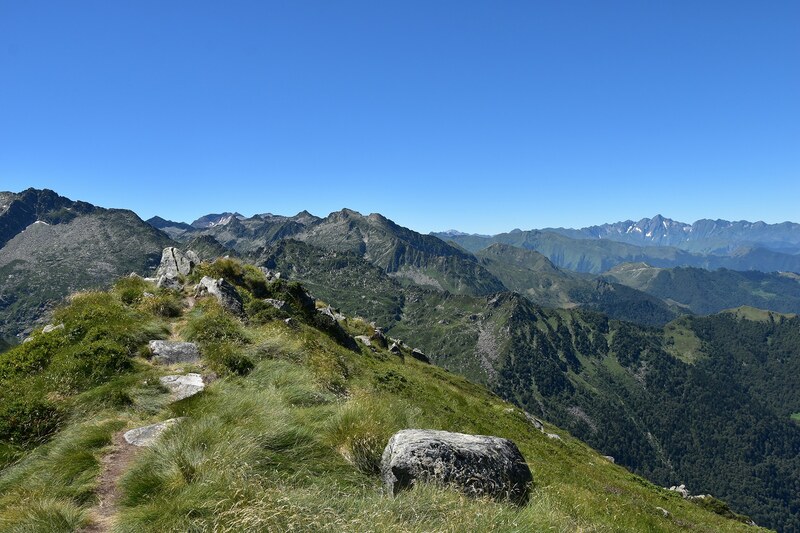 After a short, steep section, the ground eases and it is a gentle stroll to the summit of the Pic des Planes (2063m), where more panoramic views await. 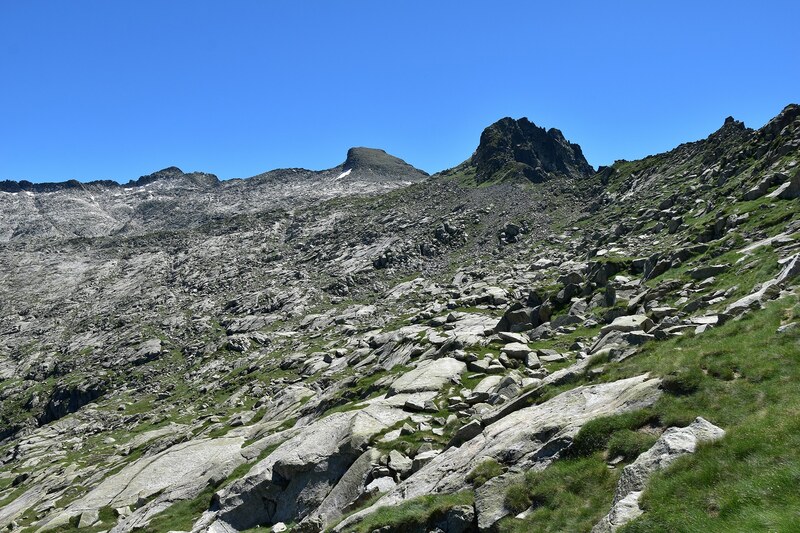 The bulky summit of the Pique Rouge de Bassiès is now clearly visible at the end of the fine, sharp rocky ridge in front of you, with a large cirque opening to its left, while the Mont Valier (2838m) can be admired in the distance to the W. You can also spot part of the Etang du Garbet, down below to the west side of the ridge. 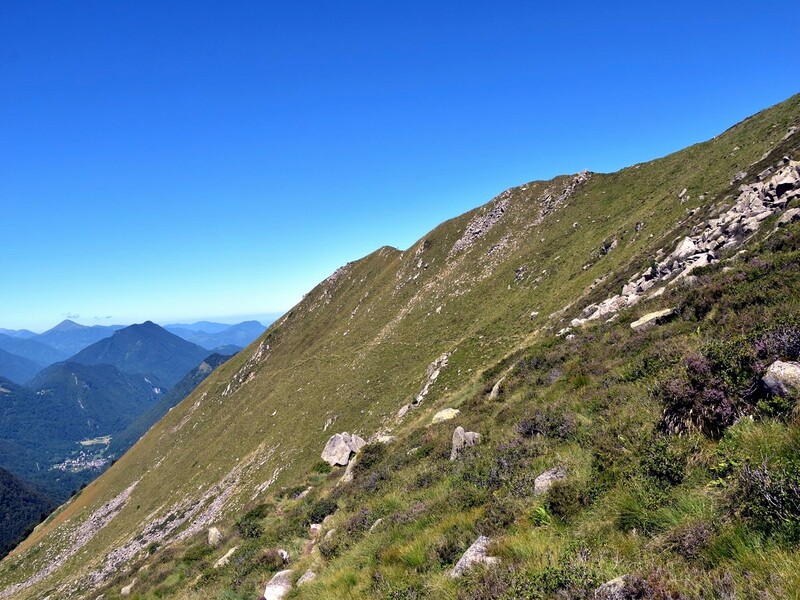 Pick the steep path to the left and drop down to the Col du Morech (2024m) and start the gentle ascent up along the ridge to reach the Cot de Morech (2145m). From there, the trail contours the left (east) side of the sharp-edged ridge, where vultures may be observed hovering over the cliffs. Follow the path over this not too demanding ascent following the yellow-marked trail. At roughly 2400m, you meet another path which comes from the SE. This trail leads around the cirque and down to the Refuge and the lakes. Keep on the main trail as it veers right, overlooking a few small lakes to the left as it heads towards the summit. 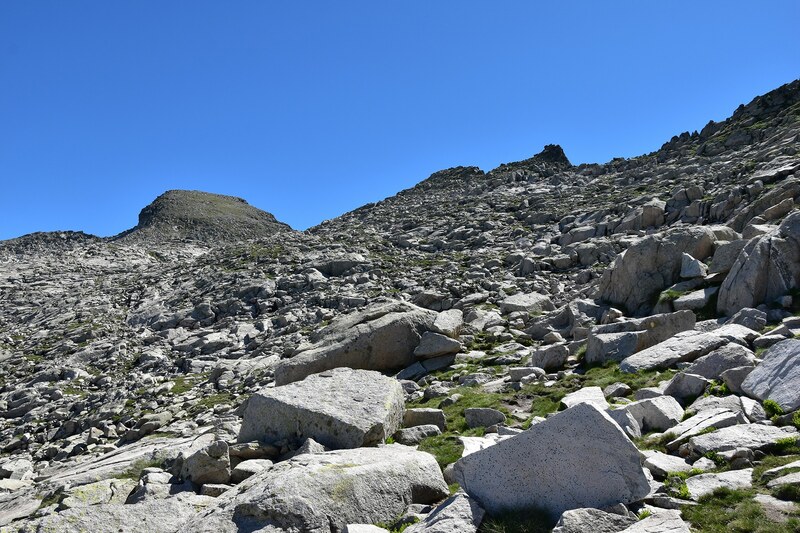 The ground gets tougher, with large boulders strewn here and there making the way is a bit less obvious despite the markings, and attention is required on this part as not to lose trace of the trail which crosses a boulder field before the last, steep push to the summit. This last part of the ascent is probably the toughest part of the hike in terms of incline, but the ground made of a mix of rock, scree and short grass makes the going not too unpleasant. 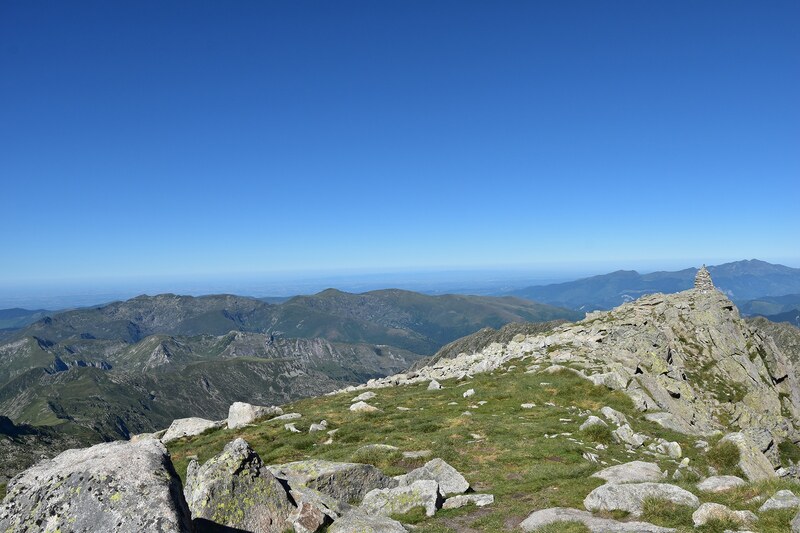 The arrival at the cairn-marked top of the Pique Rouge de Bassiès (2676m) is a pure delight, with incredible views opening to the south over the Pique d’Estats (3143m), the highest peak in Ariège, and its satellites, the Pic du Port de Sullo (3073m), Pic de Verdaguer (3131m) and Pic de Montcalm (3077m), the most easterly +3000m peak of the Pyrenees. Below you, knife-edged ridges run down to the SE and SW of the summit, dropping down into the upper Vallée de Vicdessos, while countless peaks and summits can be admired in the distance. To the N, you can spot your route along the fine ridge, with the Pic des Trois Seigneurs (2199m) barring part of the view over the plain far in the background. There is a great chance that you will have the summit to yourself. Take the time to fully enjoy the 360° vista before retracing your steps back by way of ascent. Aulus-les-Bains has a few bars/restaurants, but the best spot for a refreshment or food is the terrace of the Restaurant de l'Etang de Lers, which stands over a beautiful lake, between the Col d'Agnès and Port de Lers, about 5.5km further up the road. Campsites are available in Aulus-les-Bains, Massat or Vicdessos. 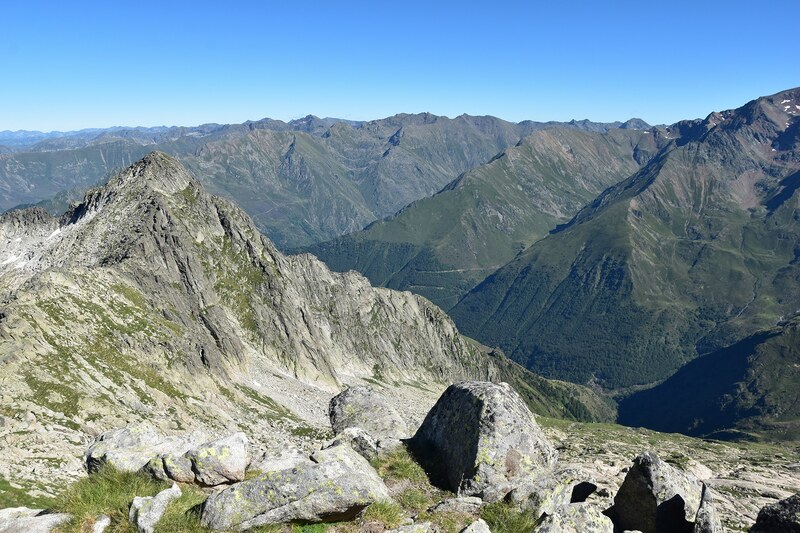 There are a few variations possible for this route; you could choose to return via the Port de Bassiès and Port de Saleix to the N, or even via the Refuge de Bassiès, close to the eponymous lakes. For this last option, veer right at the junction at ca. 2400m; note that this would add a subsequent amount both in distance and climbing. The Pique Rouge de Bassiès can also be accessed from the S at L'Artigue (a shorter but much steeper route, with about the same amount of climbing but not as many good views) and from the E at Massada (a much longer route which would add about 500m climbing, which should be best completed in two days, with a night at the Refuge de Bassiès, near the lakes). There are of course many other options for beautiful walks in the area. One of the nicest is the ascent of the Pic des Trois Seigneurs (2199m) from the Port de Lers (1517m). 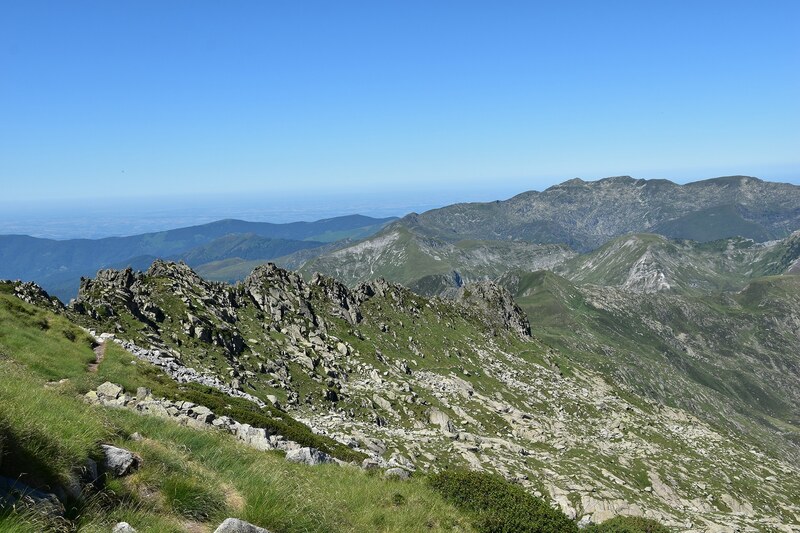 You can either make an out-and-back journey along the ridge (10.0km, +800m) or make a loop walk either clockwise or anticlockwise via the Etang d'Arbu (12.0km, +900m). You will surely spot some griffon vultures or peregrines and may also have the chance to admire paragliders flying near the Etang de Lers. The views from the ridge towards the main Pyrenees to the S is fantastic. Other popular walks in the area include the Cascade d'Ars, a 246m waterfall, and the Cascade du Fouillet. Both walks can be started from Aulus-les-Bains.